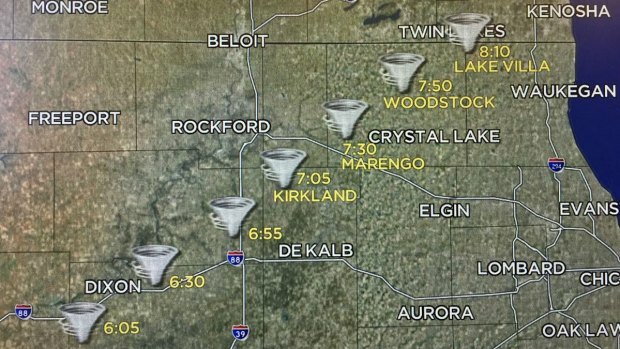 At least two tornadoes, but likely more, touched down on several Northern Illinois communities on Thursday, National Weather Service forecasters said, based on reports from trained storm spotters and chasers as well as radar and environmental evidence. The first report came a little after 6 p.m., with the storm tracking to the northeast. It hit the communities of Kirkland at 7:05 p.m., Woodstock at 7:50 p.m. and Lake Villa at 8:10 p.m. before dissipating. The hardest hit communities were Cherry Valley, Flagg Center, Fairdale, and Kirkland. At least two people were confirmed dead in Fairdale as of midday Friday.